Set in a prime location of Vientiane, Xaysomboun Boutique Hotel & Spa puts everything the city has to offer just outside your doorstep. Offering a variety of facilities and services, the hotel provides all you need for a good night's sleep. Take advantage of the hotel's free Wi-Fi in all rooms, daily housekeeping, ticket service, 24-hour front desk, express check-in/check-out. Guestrooms are fitted with all the amenities you need for a good night's sleep. 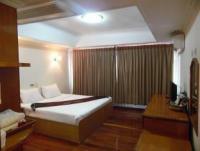 In some of the rooms, guests can find television LCD/plasma screen, complimentary instant coffee, mirror, slippers, towels. Access to the hotel's outdoor pool, spa, massage will further enhance your satisfying stay. Xaysomboun Boutique Hotel & Spa is an excellent choice from which to explore Vientiane or to simply relax and rejuvenate.